It was not at all easy for Meena to forget everything and smile again. The loss seemed too much to be overcome by anything on this earth. Her dreams were all broken just within a fraction of time. The whole day she kept on crying- lamenting and her fate while uselessly recollecting the broken pieces of her shattered dreams. It was too late at night and now she was tired of crying the whole day. Finally she got up from the dark corner of her closed room and came outside in search of some fresh air. The moment Chinu saw her; he came running to her to shower all his love upon her. No amount of darkness could have hid the shine in his eyes which conveyed his love for Meena. Chinu did not waste a single moment to lick all over her face, neck and hands. Meena too hugged him tightly and kissed him all over again and again. Along with Chinu she went downstairs and was surprised to find out her mother still waiting for her at the dinner table. The moment she entered the dinning room her mother scolded her a bit for coming so late for dinner. While she was still having her dinner, her father came out of his room to have a glass of water. Before going back he just kept his hand on his daughter’s head for a moment and without even uttering a single word left for his room to sleep. While she was going back to her room her li’l brother came to her out of no where just to give her a good night kiss. She hugged him tightly and kissed him on his forehead and very lovingly told him to go back to sleep. The twinkling in his bright eyes didn’t escape Meena’s. Its not the first time that Arpu gave her a good night kiss. But for the first time she felt the warmth of the kiss deep within her heart. When she was just two steps up; her mother called her back. She turned back to find an envelope in her hands. Within a flash of a second she understood what this envelope carried in it. Now her eyes were brimming with tears. Before she could utter a single word her mother hugged her tightly and said that they all are very proud of their darling daughter and they have full believe in her that very soon she would forget her past and would start a new bright life. Back to her own room she was so happy that she wanted to shout on top of her voice. After all she has made it to one of the top universities of UK. At last her hard works were paid off and very soon she was going to fulfill her long cherished dream. Now Meena was all alone in the balcony with her ipod and Chinu lying near her cane sofa. At this moment of night strangely she was not thinking of him any more instead she was thinking about her dog, mom-dad and her li’l naughty brother. This time Meena didn’t fail to understand the love and concern behind her mother’s endless scolding. She knew that her dad always keeps a bottle of water near him while sleeping at night but still he got up so late at night and came out for water. And this time her small brains didn’t have to struggle at all to find out the reasons for his dad’s behavior. She can never forget the goodnight kiss that her li’l brother gave her. And her dog…wow Chinu is the cutest dog in this whole world and anyone can even die to have a dog like him. Isn’t it strange that Meena was crying the whole day for someone who didn’t even think twice before leaving her forever everyone around her were all sweet and loving to her even after she has almost forgotten them all? The whole day she kept her cell phone switched off to wallow in her sorrow and broken pieces of dreams. And in the process of doing so she turned blind towards the colors of life, forgot to feel the happiness around, forgot to realize that her near and dear ones were equally in pain because she was not happy. She had deliberately shut her eyes and had turned her back towards a life which is worth living for. All of a sudden her cell phone started ringing and with a jerk she came out of her world of thoughts. Just within 10 minutes of switching on the phone, her best friend called her up. Radha was trying to reach her since morning and was not able to sleep before having a word with her. She was worried about her and had called her up so late at night just to ensure that everything was fine with her. And she was as happy as Meena about her getting selected in one of the top UK universities. Before keeping the phone she also gave her the news of Parth’s coming back and hanged up the phone after Meena promised to give a grand party to all of her friends. For few moments Meena’s thoughts were encircled around Parth. He was one of the best guys she had come around in her life. Parth was always in love with her and now even after so much had happened, Meena was aware of the fact that he still loves him. Absent mindedly Meena got up from her cane sofa and with a bag full of hope and a new approach towards life went towards the railing of her balcony. She was looking at the moon with her eyes brimming with dreams and happiness. Few little tear-drops escaped her eyes and suddenly she saw a formation of a sparkling web of colors which slowly took the shape of a rainbow when moon light entered through the teardrop that was stuck in her eye lashes. 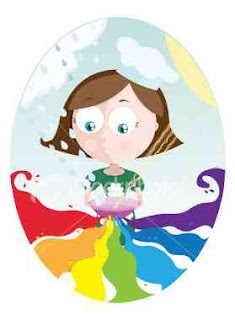 For the first time in her life she experienced a rainbow consisting not of the seven but of divine eight colors. Through the glistening tear drop, she visioned the eightth color of the rainbow- yes it exists. It does exist in her colorful horizon of life. Deep inside her heart she understood that this eighth color is exclusively for her. No one else can ever know about the existence of this eighth color. It is she who will live this divine eighth color. Suddenly her phone beeped. She opened her inbox to find out a SMS from Parth. Unknowingly she smiled a smile which reflected her happy heart. She again submerged herself in her eight colored rainbow and very lovingly whispered Parth’s SMS into the ears of this beautiful night and the blowing wind carried the SMS to the moon which witnessed this beginning of a new dawn in Meena’s life. While she was enjoying her divine rainbow; the whole night sky including the moon, the stars, the leaves around and the blowing wind kept on echoing each and every word of Parth’s SMS, as if the whole universe was celebrating the joyful union of Meena’s divine eight- colored rainbow and Parth’s divinity entangled SMS. **P.S: texts in red is a quotation i found out while net browsing. A very heart touching post, Preeti! Nicely created and loved every bit of it. Loved every piece of it..specially the text in red..well writting! smiles se bhara hua bada hi heavy commnt tha light kaise leti. do hop by my blog... there is something for you.. Thanks for colour again my Hope! allow the light to pass through a tear drop and a rainbow appears...!! super!! mamma u r a darling. yep u got d meaning right.